Every time I think about this recipe, that phrase goes through my head. I don’t even know where it came from, but it’s fun to scream in the kitchen by yourself while your cooking this beauty. Truth be told, this was my first time EVER making meatloaf. But seriously friends, this came out perfectly. Even though I was nervous to try, I am beyond happy I did. Taking the leap is something that we should all strive to do, and I reflected on that while writing out this recipe for you. If you had told me three years ago that I would be capable of doing a handstand push-up or clean and jerking nearly my bodyweight, I would have looked at you in disbelief. That’s such a shame- why didn’t I believe in myself then? Well, I believed in myself to make this meatloaf. So, I’m going to believe in myself as I work toward the goals I wrote down with Shannon. You better believe in yourself, too. Humans are far more capable than we think. I believe that one hundred percent. Challenge yourself to get after it and use this yummy Italian goodness as fuel to get you there. 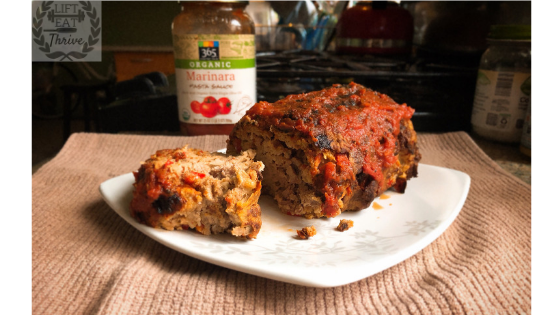 When I saw my favorite blogger, Juli Bauer-Roth (Paelomg) created an air fryer meatloaf, I was inspired to create my own! Feast your eyes on this Italian Herb Marinara Meatloaf! I absolutely love how this turns out crispy on the outside while still full of flavor and juicy inside. I was amazed and LOVE this as a protein for meal prepping! It pairs well with roasted vegetables, would be lovely beside some whole grain pasta, or even tossed on top of a colorful salad with Italian dressing. 1/2 lb ground venison (or other meat of your choice- this was from a friend! 1. First, mix all ingredients in large bowl, kneading by hand if needed. 2. Next, form into a loaf shape or place into non-stick silicone loaf pan. 3. Depending on your cooking device, set oven OR air fryer to 400 degrees. 4. Cook for 30 minutes, drizzle with more marinara, then cook for another 15 minutes. 5. Once crispy on the outside and moist inside, serve with marinara on the side or poured over top.